I love me some Chinese food. Loooovvveeeeee. I don’t love how I feel after eating Chinese food. This is a small problem if you’re like me and just can’t stay away from it. 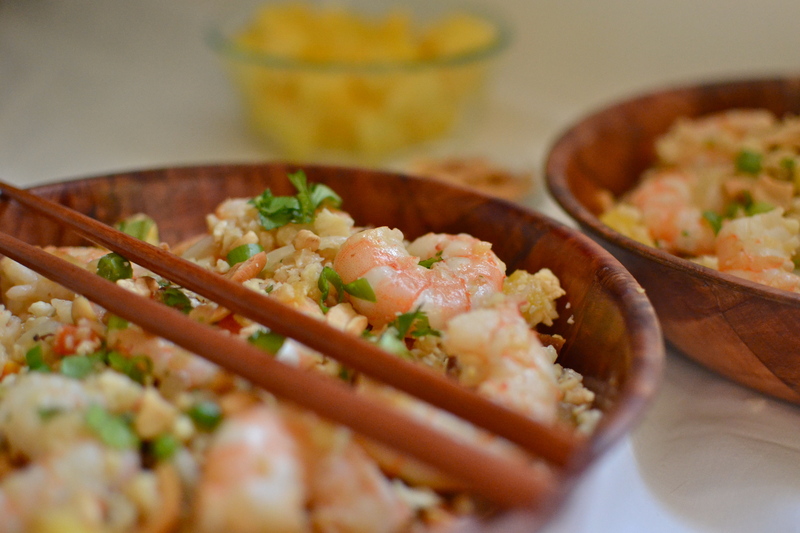 At least once a month I get the strongest urge for fried rice.Not just any fried rice though, it has to be the fried rice from the one place that makes Chinese food I actually like. No, it’s not Panda Express. That stuff doesn’t count as Chinese food. Anyway, the urge comes on strong. Like, gotta have it right now or I’ll punch CJ square in the face. At this point he’s usually driving us to our favorite Chinese joint, scared of what he knows will happen if we sit at home any longer. We haven’t been since switching to paleo eats. Needles to say CJ has suffered his fair share of bruises because of it. It’s not my fault though!! I blame it on their rice, it has me under its spell. Since I’m tired of living without my beloved dish, and because CJ is tired of having face bruises I threw together my own fried rice. Face bruises and stomach aches not included. 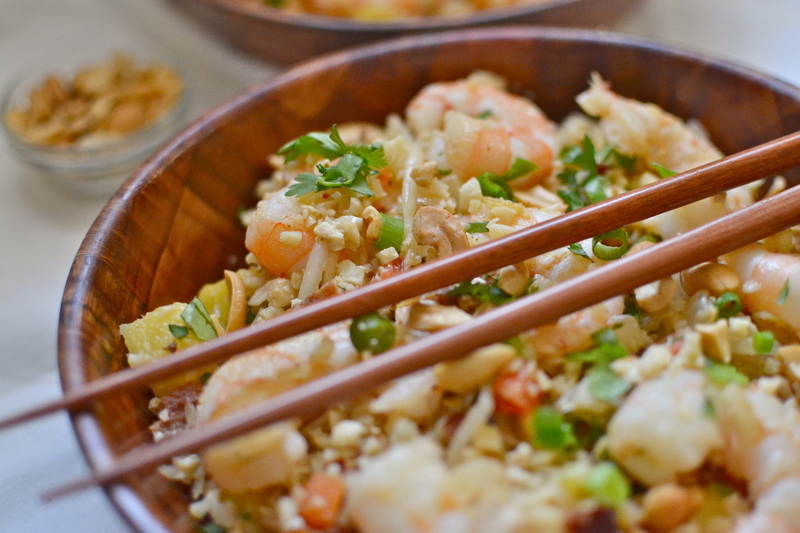 Fried rice is easiest to cook when all the ingredients are prepped and ready!! In a large saute pan cook bacon until crisp. Remove and set aside, leaving the oil in the pan. Crumble when cooled. Add onion to pan and cook over medium high heat until onions soften, about 8-10 minutes. Add in half the garlic, ginger, and half the green onion, cooking an additional minute. If the pan becomes too dry add a cooking oil, 1/2 tbsp at a time. I had enough bacon fat, but it will vary with the different brands of bacon. Push the aromatics to the side and crack the eggs into the pan. Scramble and cook until almost fully cooked. stir in the bell pepper, pineapple, sprouts, and pea & carrot mix. Crank heat up to high, adding in pulsed cauliflower. Add coconut aminos and some freshly cracked pepper. Stir so every things well combined. Cook until cauliflower is cooked through, about 5-8 minutes. Add in reserved bacon crumbles at the last second. Season to taste. 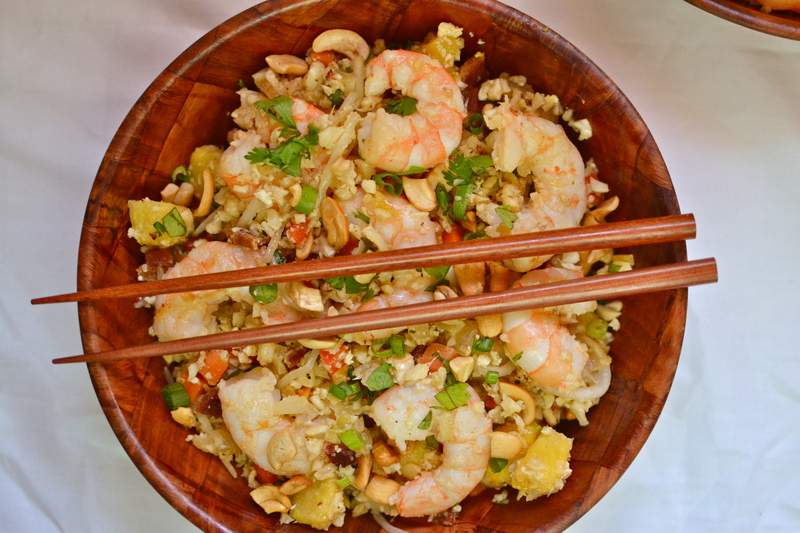 Set aside if making prawns, or serve as is garnished with cilantro and cashews. Heat butter or ghee in a large sauté pan over medium high heat. I used the same pan the cauli rice was cooked in. Once hot, add the rest of the garlic. Cook about a minute, stirring so the garlic doesn’t burn. 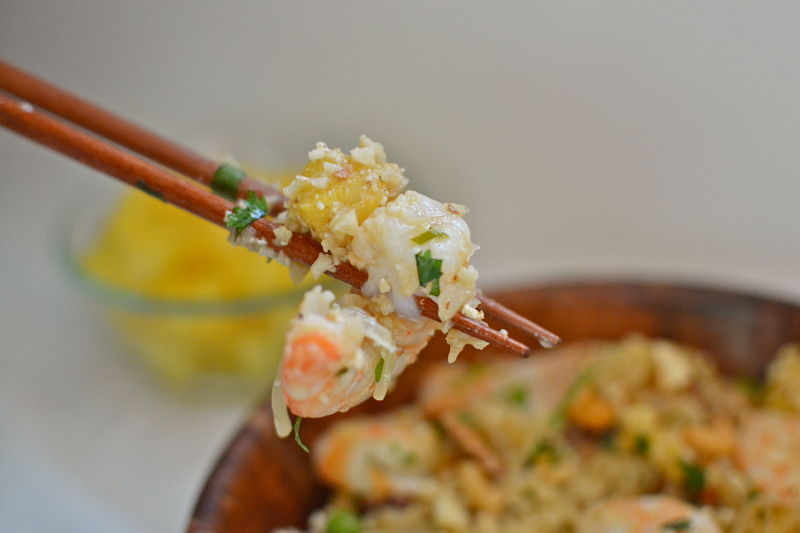 Add prawns and lime juice to pan, cooking until they are pink and opaque, about 4-6 minutes. Don’t overcook or they will get rubbery. 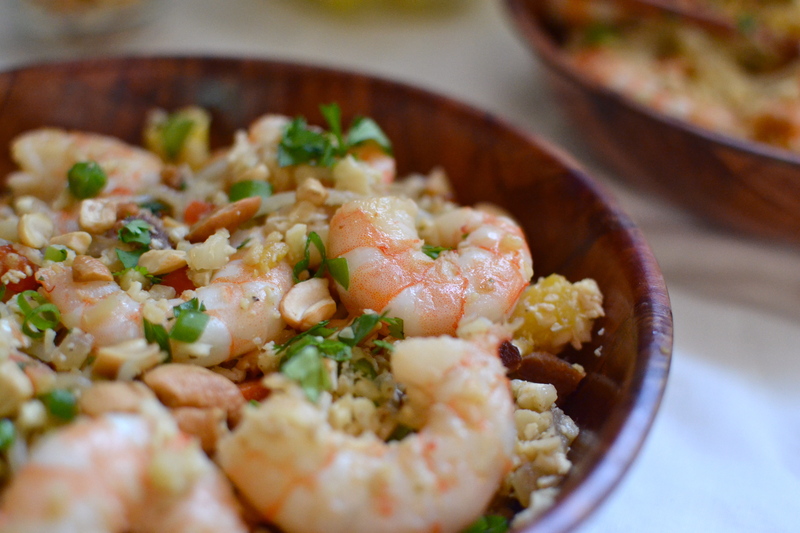 Serve with the cauli rice, adding toasted cashews and cilantro for garnish. Wow! I just made this and it is amazing! Thank you so much for this recipe! Did you make it up?